The Mints that are good for you. Want to reduce cavity-causing bacteria simply and quickly? 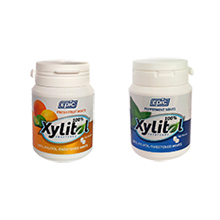 A recent study suggests you need 5-12 grams of xylitol a day to do just that and each Epic Xylitol mint contains 0.5 grams. Our Sugar-free Xylitol Mints are sweetened with 100% xylitol, and that’s why so many people are putting our little tins in their cars, pockets, and purses, because the store-bought brands simply cannot compare. Choose Cinnamon, Fresh Fruit or Peppermint flavored mints in 180 piece bottles, 60 mint tins or 500 piece individually wrapped packages. Epic Mints are also made in the USA. P.S. Our bottles are Bisphenol-A (BPA) Free!